What’s wrong with bringing a few children’s toys with you, when you visit Australia in the run-up to Christmas? Quite a lot, if they conceal 13 kilograms of the drug ice. 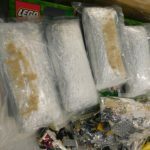 An American woman has been charged with a serious drugs offence after allegedly attempting to import 13 kilograms of methamphetamine, sometimes known as ice or crystal meth, into Sydney Airport, concealed inside boxes of children’s toys. When the 37-year-old arrived on a flight from San Francisco last Sunday morning (25 November 2018), Australian Border Force (ABF) officers selected here for a baggage examination. ABF officers uncovered 25 packages hidden in four boxes of children’s toys. The packages weighed approximately 13 kilograms in total, and presumptively tested positive for methamphetamine. Photos of the haul released by the ABF indicate that some of the packages were hidden in boxes of Lego. The Australian Federal Police (AFP) said it would conduct further forensic testing to determine the exact weight and purity of the substances. AFP officers arrested the woman and transported her to Mascot Police Station where she was charged with importing a commercial quantity of border controlled drugs, contrary to section 307.1of the Criminal Code 1995 (Commonweath). The maximum penalty for this offence is life imprisonment. ABF regional commander NSW, Danielle Yannopoulos said criminals should be aware that the ABF and its partner agencies have them in their sights. 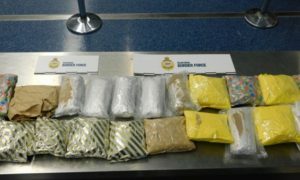 “ABF officers have the skills, training and technology to detect these dangerous drugs at the border, no matter how criminals try to hide them,” Yannopoulos said. The woman appeared in Central Local Court on Monday.